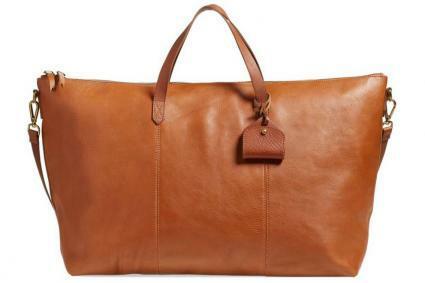 Everybody needs a perfect weekend bag in their life for those overnight periods of travel. Whether you're packing for a last minute weekend getaway, or going on a short minibreak that you've had planned for months, a great weekend bag makes the whole process feel much less like a chore. The trick is to find a weekend bag that is spacious and functional, but also looks fabulously stylish on your arm. A keen favorite across BestProducts.com, Travel + Leisure and Elle Magazine, the Transport Weekender is an oversized version of Madewell's famous Transport tote. This beautiful bag not only has a hanging ID tag and two-way zip closure, but it also features a detachable shoulder strap that makes it so much easier to carry than the average weekend bag. At just under $300 from ShopBop.com, the Madewell Transport Weekender in the classic "English Saddle" tan hue is a best seller; however, it comes in a lush, traditional black hue too. Not only does the bag look impressive, but its all-leather exterior makes it soft and flexible for packing all of the vacation essentials. Furthermore, the waxed finish is water resistant, making it a practical, yet aesthetically pleasing weekend bag option. The boxy shape of Kate Spade's Lyla Weekender has given it multiple, well-deserved mentions in publications such as Huffington Post and Travel + Leisure. At around $348 from Nordstrom, it has a nylon exterior that's lightweight, waterproof, and manipulatable - and puts a contemporary twist on some of the more old-fashioned weekender bags. Plus, the Kate Spade Lyla Weekender has a secret, stowaway compartment at the bottom of the bag - ideal for storing an extra pair of shoes! 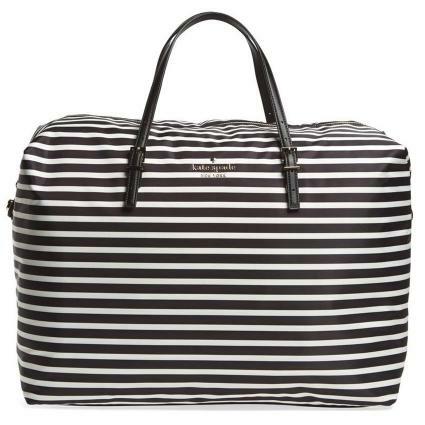 Not only is this weekend bag a roomy and practical option, but its Black and Cotton Cream stripe design offers both charm and character. 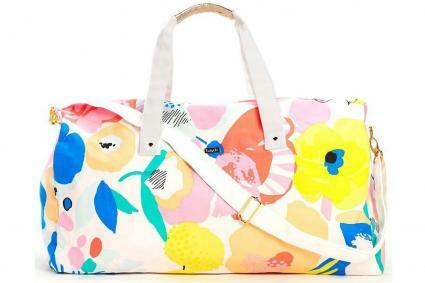 With sturdy handles, and a removable shoulder strap for versatility, it's difficult not to fall a little bit in love with the Kate Spade Lyla Weekender. Rated 4.5 out of 5 stars, the Everlane Twill Weekender is the brand's most popular weekend bag on their site. Also featured in Travel + Leisure and on BestProducts.com, fashion followers worldwide praise this ethically-made bag for its cotton, water-resistant exterior and purse-friendly price tag at about $115. It's also loved for its perfect size; the Everlane Twill Weekender is large enough to store all of your weekend possessions, but small enough to fit in a plane or train's overhead compartment. 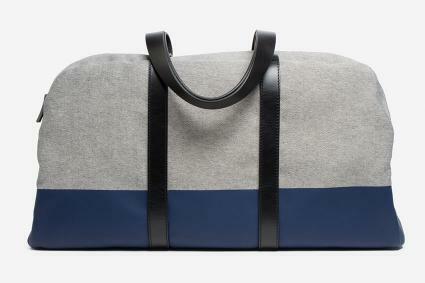 The Everlane Twill Weekender is known to be one of the most versatile weekend bags out there on the market at the moment, simply due to the range of gender-neutral colors available. You can currently choose from nine different options that will complement whichever outfit that you decide to travel in, no matter what the color palette is. A fashion-favorite amongst BestProducts.com reviewers, Elle Magazine industry professionals, and The Purse Blog's handbag experts as an investment bag, the Louis Vuitton Keepall Bandouliere 55 is the ultimate designer carry-on. This iconic bag originated in 1930 and comes in an array of different sizes. However, it's recommended that you invest in a size under 60, due to the extra weight felt primarily on the shoulder. Lightweight and supple, the Louis Vuitton Keepall Bandouliere 55 is a flexible weekend bag option that can be used for a variety of occasions. It features leather straps and handles, as well as a removable shoulder strap with shoulder patch, and is cabin-size. The Louis Vuitton website claims that you can easily fit a week's wardrobe into this little number. At about $1760, it comes in an array of colors, with its most popular hue being the traditional Louis Vuitton Monogram Canvas. If you like to make a statement when you're traveling, then this weekend bag is definitely the one for you. Praised for its ability to liven up even the most dull and drab stuffed overhead compartments, the Ban.do The Getaway Duffle Bag from Amazon is loved by Travel + Leisure and Elle Magazine alike, and also has a place in Rank & Style's Top 10 Weekend Bags for Under $100. Not only is it a fun and budget-friendly option at about $54, but it's also lightweight and flexible due to being manufactured from 80 percent cotton with a high quality cotton lining. If you're in a hurry, the two strong handles allow you to simply grab it-and-go - and the adjustable canvas shoulder strap is a welcome point of differentiation that will sit comfortably on your shoulder. With enough space to fit all of your weekend items and more, the Ban.do The Getaway Duffle Bag is a durable, yet fashion-forward, weekend bag option that you can't help but feel drawn to. Whether you're looking for a smart, luxury overnight bag for a business trip, or a casual alternative for a weekend away with your loved ones, these options offer something for everyone. They're endorsed by top publications for a reason, with great features and details that make them perfect for your next trip. Take the time to invest in the right design for a great weekend bag that will truly last the test of time.